Paisley Abbey Church stands in the heart of Paisley, in a slight curve in the White Cart Water and just to the east of Paisley Town Hall. Built largely of a fine grey stone it has a striking presence and complements the yellow stone of the much more ornate and recent Town Hall. 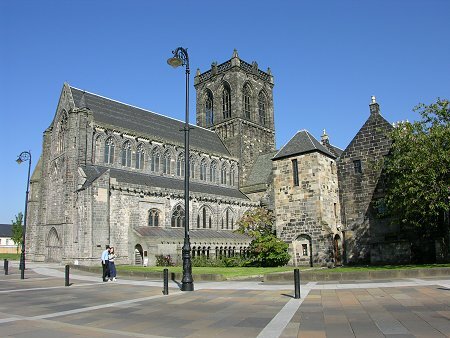 Paisley Abbey's origins date back to 1163 and the signing of a charter by Walter Fitzalan, the High Steward of Scotland, for the founding of a Cluniac priory on land he owned in Renfrewshire. Fitzalan was one of the English Normans brought to Scotland by David I in the mid 1100s. The large estates granted to him by David included much of Renfrewshire, and he ran them from his castle in Renfrew. Fitzalan probably felt that the piety demonstrated by his commitment to the Abbey had paid early dividends when just a year later he defeated the army of Somerled, King of the Isles, at Inchinnan close to the River Clyde and a few miles north of Paisley. 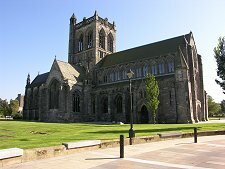 Paisley Priory was first established by thirteen monks from Wenlock in Shropshire, and was answerable to the Abbey of Cluny in France. 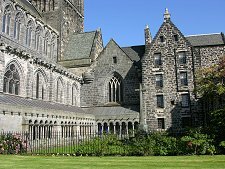 Paisley became an Abbey in its own right in 1219, by which time it probably comprised a choir and a number of side chapels. In 1244 monks from Paisley established a daughter house at Crossraguel Abbey near Maybole. 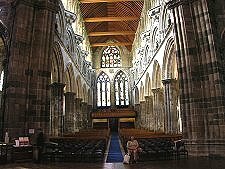 Amongst those educated at Paisley Abbey in the late 1200s was William Wallace. In the Wars of Independence against the English, the 5th High Steward of Scotland supported the Scottish cause. In retaliation the English burned down Paisley Abbey in 1307. It was rebuilt during the remainder of the century. In 1498 fire damaged the Abbey, and restoration once again followed. But in 1553, pre-empting the Reformation by seven years, the entire tower of the Abbey collapsed, seriously damaging the north transept, crossing and choir in the process. In Scotland post the Reformation of 1560 there was no prospect of serious repairs being undertaken to the Abbey. Instead the nave was walled off to become the Parish Church of Paisley and the choir became a graveyard. The domestic buildings to the south of the Abbey, known as the Palace or the Place of Paisley, were later sold off and went on to become a drinking house, pawn shop and to see possibly even less reputable uses. The tide turned for Paisley Abbey in the middle of the 1800s. Restoration of the north transept took place in the 1860s, while between 1890 and 1910 much of the rest of what was lost when the tower collapsed in 1553 was also restored and the nave was rejoined to the rest of the Abbey Church. In 1907 the Kirk repurchased the Place of Paisley for later restoration. It is now the Abbey gift shop and cafe. In 1981 a magnificent timber ceiling was erected in the nave, to replace a "temporary" plaster ceiling inserted in 1788. More work since 1989, both to the Abbey itself and to the surrounding area, has resulted in a truly wonderful building, probably looking better today than at any point in its very long history. Though the west gable of the nave, which leans outwards at an angle that would put the Leaning Tower of Pisa to shame, remains disconcerting to first time visitors. 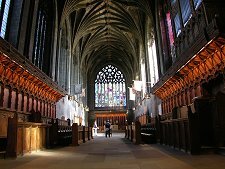 It says much of the skills of the craftsmen and women who have worked on Paisley Abbey over the past 150 years that this history of relatively recent restoration is not at all obvious to the visitor, except through the superb quality and condition of everything on display. As you might expect, the main body of the Abbey Church comprises the nave to the west of the tower and the choir, longer but narrower than the nave, to the east of the tower. There is a transept to the north, while to the south of the tower a very short transept leads to the St Mirin Chapel. 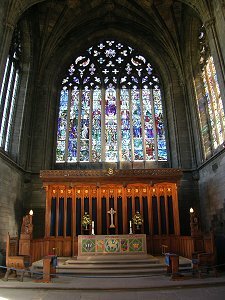 This has an east window which serves as Paisley's war memorial. 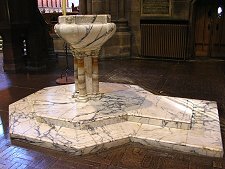 The chapel also keeps alive the memory of St Mirin, the Celtic monk who established a church not far from where the abbey was later founded in the late 500s. Paisley Abbey's history is not overlooked in the Abbey today. In the nave, the association with William Wallace. is celebrated by the Wallace Memorial Window, placed here in 1873. Also on view is the marble tomb of Robert III, which commemorates all the Stewarts buried in the abbey, including Princess Marjorie. 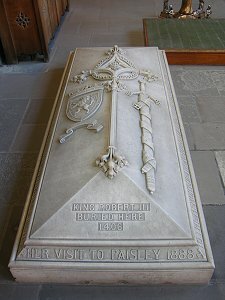 The tomb was gifted to the Abbey by Queen Victoria when she visited in 1888. Much more recent is the superb James D.D. 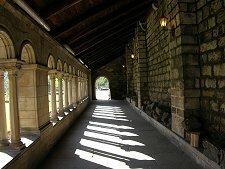 Shaw Memorial Window erected in 1988 and shown on the left. 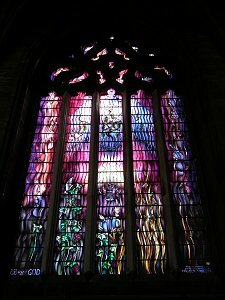 It is good to see that even the oldest and longest established buildings can evolve over time, but while the design of this beautiful window is most certainly modern, the techniques and materials used would have been familiar to craftsmen in the 1300s.